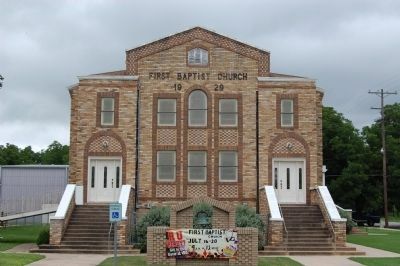 Originally known as Pecan Grove Baptist Church, this fellowship was organized in 1873 by the Rev. M.V. Smith, the Rev. H.I. Kimball, and the Rev. G.W. Baines, great-grandfather of United States President Lyndon Baines Johnson. 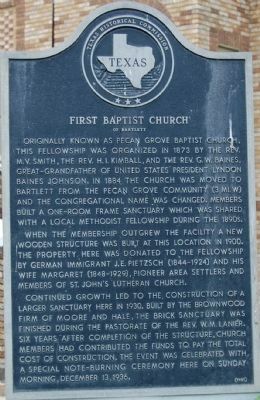 In 1884 the church was moved to Bartlett from the Pecan Grove community (3 mi. W) and the congregational name was changed. Members built a one-room frame sanctuary which was shared with a local Methodist fellowship during the 1890s. When the membership outgrew the facility a new wooden structure was built at this location in 1900. The property here was donated to the fellowship by German immigrant J.E. Pietzsch (1844-1924) and his wife Margaret (1848-1929), pioneer area settlers and members of St. John's Lutheran Church. on Sunday morning, December 13, 1936. Location. 30° 47.828′ N, 97° 25.785′ W. Marker is in Bartlett, Texas, in Bell County. Marker is on W. Bell St., on the right when traveling west. Touch for map. Marker is at or near this postal address: 210 W Bell St, Bartlett TX 76511, United States of America. Touch for directions. Other nearby markers. At least 8 other markers are within walking distance of this marker. Woman's Wednesday Club (about 400 feet away, measured in a direct line); Bartlett Grammar School (about 500 feet away); City of Bartlett (about 500 feet away); First Presbyterian Church of Bartlett (approx. 0.2 miles away); Site of Booker T. Washington School (approx. 0.3 miles away); First National Bank of Bartlett (approx. 0.3 miles away); First United Methodist Church of Bartlett (approx. 0.3 miles away); Mount Arie (Mount Ararat) Missionary Baptist Church (approx. half a mile away). Touch for a list and map of all markers in Bartlett. More. Search the internet for First Baptist Church of Bartlett. Credits. This page was last revised on June 16, 2016. This page originally submitted on March 23, 2010, by Keith Peterson of Cedar Park, Texas. This page has been viewed 1,004 times since then and 6 times this year. Photos: 1, 2. submitted on March 23, 2010, by Keith Peterson of Cedar Park, Texas. • Bill Pfingsten was the editor who published this page.